The 2011 Census registered 10,198 households in North Horsham and in 2017 there were 17,119 electors on the electoral roll. Parish Councillors distributed 10,000 leaflets (see below) across the parish during June 2018. In total 63 people responded. Of those 5 were against making a Plan. 57 were in favour and 1 person asked for more information. 26 people offered support although several of those indicated that support would be limited. It has been estimated that the financial cost of making a Neighbourhood Plan would be in excess of £25,000 and that once it had been made it would need to be reviewed on a two to three yearly basis. So in addition to the resource for making the Neighbourhood Plan, there would need to be an ongoing commitment to collect the evidence required to support any policies that may be made in a Neighbourhood Plan and to set aside funding to complete the review process. One of the benefits of making a Neighbourhood Plan is that the community receives 25% of any Community Infrastructure Levy (CiL) money paid on certain new development. Without a Neighbourhood Plan, the community receives 15%. The benefits from the development north of Horsham will come through a Section 106 legal agreement, so there will be no CiL money. There are pockets of undeveloped land which could attract some CiL money in the future, but it unlikely to be more than the cost of making a Neighbourhood Plan and the review process and there is no guarantee that a Section 106 agreement wouldn’t be made. The cost for testing out the response to a Neighbourhood Plan was £300 for the cost of the printing of the leaflets. This was considered to be a sensible use of funds to ascertain public feeling and level of support. The Council was very appreciative to residents who took part in the survey and who offered to support their community. The Council is very keen for local residents to be involved in the community and in the Parish Council and greatly values any support that was offered. 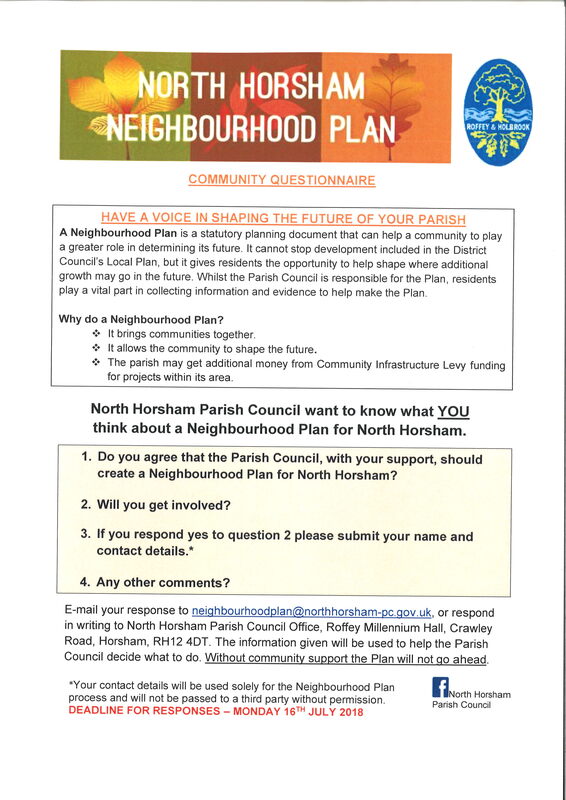 The Parish Council formed a Neighbourhood Plan Steering Group in 2017 and the notes of the meetings can be found blow. The Steering Group has now been disbanded.